We could start this article by sharing our views on the morality of luring children into fast food resultants via free toys, but then we remembered our tagline: “finding the fun”. That subject would be precisely no fun at all to discuss. 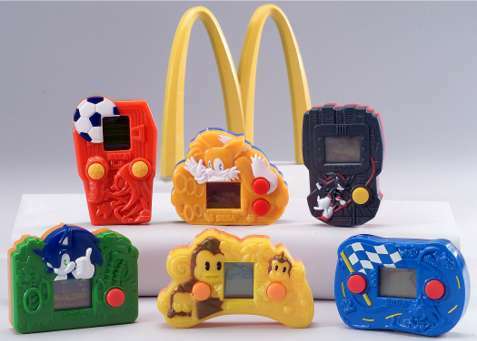 Fun can be had though by looking back at the various videogame franchises that have been turned into McDonald’s Happy Meal and Burger King Kid’s Club toys over the years, especially after discovering that there are plenty of amusing adverts available on YouTube. With Skylanders Happy Meal toys currently available in the US, and due worldwide soon, has there been a better time to take a lookback? No. Considering gamers flocked to cinemas in 1989 to watch The Wizard so they could catch a glimpse of Super Mario Bros. 3, it’s not hard to imagine that McDonald’s Super Mario Bros. 3 Happy Meal toys caused a similar commotion. After all, nothing can make a child happier than opening a cardboard box to find Mario’s face starring back at them. That’s unless that cardboard box was home to a tramp, and located round the back of McDonald’s, of course. We recall owning two of these – a Koopa Paratrooper that could hop by squeezing a red pad filled with air, and a Goomba that was supposed to back-flip via a suction cup. 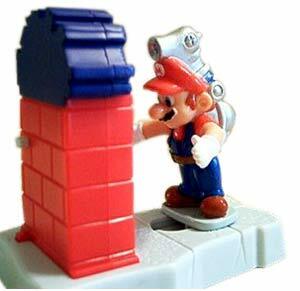 Mario meanwhile could leap in the air via a large spring shoved up his behind, while Luigi could whizz around by harnessing the power of a pull-back motor. 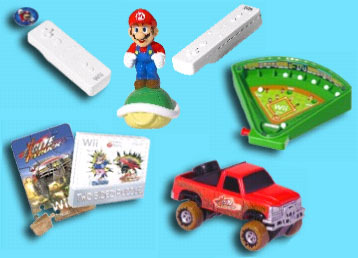 Backed by a glitzy TV advertising campaign, McDonald’s Super Mario Bros. 3 toys are very well remembered. It was four years until the next videogame promotion rolled around. Even so, McDonald’s Sonic 3 toys weren’t that dissimilar from the above – a Sonic pull-along, a Tails ripcord flyer, a Knuckles spinning thing and a Robotnik vehicle on wheels. Oddly Robotnik was based on the cartoon series’ rendition of the evil genius, rather than from the classic Mega Drive platformer itself. Skip forward to 2006, and Mario showed his face in McDonald’s again. These toys were designed with exercise in mind – clearly an attempt to promote the restaurant’s “healthy” image. Youngsters were invited to “Take the Mario Challenge” using their freebies, which were things like an inflatable tennis mallet with a plastic tennis ball, a rubber ball with Mario’s mug on, and a spinning disc featuring a Donkey Kong design. Easily the best of the lot was a plastic Yoshi designed to clip onto the owner’s finger. The idea was to use it to play ‘tag’ – when pushed Yoshi would emit that noise. If you’re thinking that the Mario ball looks familiar, that’ll be because it’s seemingly based on artwork from 2004’s Mario Pinball Land. Showing no bias towards fast food chains, last year saw Wii U toys in Burger King to promote the console’s release. 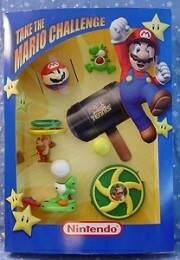 As well as pose-able Mario and Luigi figures, there were other toys that veered on the creative side. 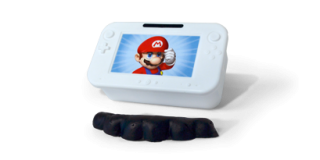 One, believe it or not, allowed you to mould a moustache out of clay by placing it in the Wii U-shaped mould and pushing down. Another contained a set of ten Diddy Kong toys similar to those included with the board game Tumbling Monkeys. “Don’t let Diddy Kong fall” read the box they were contained in. As if we’d do such a thing. Another featured a small plastic Wii U GamePad that could fire discs, along with a target to aim for. There was also a Donkey Kong bowling game with Donkey Kong’s barrels. 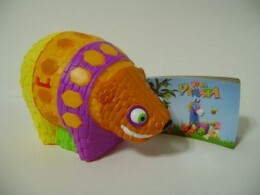 When compared to the above, the pull-along Koopa shell toy was something of a duffer. Why would anybody want that over a clay moustache maker? 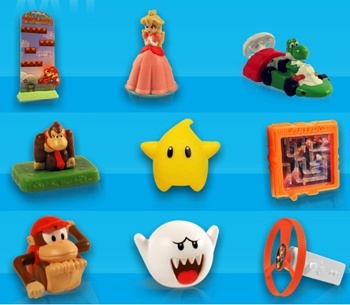 Better still was Burger King’s Nintendo Superstars, which pre-dates the above by ten years. These were intended to replicate scenes from Nintendo’s games, including Super Mario Sunshine. For this promotion the toys were placed in “blind bags” – 10,000 were randomly coated in gold paint. Finding one of these netted the owner a Game Boy Advance game as a prize. Of the ten toys, we feel that the Zelda and Kirby games were the best of the bunch. The Kirby game saw the pink… thing… enclosed in a plastic dome along with dozens of red balls that could be fired into his open gob. Link, meanwhile, was connected to a platform and span around, knocking “enemies” down with his shield. There was also a Diddy Kong catapult toy. The nice thing about this one was, unlike the other figures, Diddy Kong was detachable and thus could be easily transported to a microwave or steam roller. 2002’s range was pretty decent. Perhaps even the best freebies Burger King gave away. In comparison, 2008’s range was dire. It speaks volumes that the best of the bunch was a Mario Galaxy ‘Luma’ star that lit up. Other examples were a little Metroid maze in which the ball had to be manoeuvred through using a magnet inside a mini Wii remote. A poor effort, all in all. If that Boo was connected to a key-chain then we may have been interested. Wendy’s range from 2007 wasn’t particularly great either. A toy truck from Excite Truck isn’t very exciting in our book. The same goes for a Wario Ware jigsaw puzzle. At least the Wii remote – which fired plastic discs – could be used to annoy parents, siblings and animals. The baseball game, supposedly based on Wii Sports baseball, wasn’t entirely free of creativity either. There have been enough Pokemon toys given away at both McDonald’s and Burger King over the years to write an entire article about. We struggled to even count the number of times the fast food duo have run Pokemon promotions. Burger King did it first though, in 1999 alongside the first Pokemon movie. Their first line of toys was so popular in fact that there was a 30 percent increase in sales. It’s assumed that the promotion’s popularity was down to having 60 toys in total to collect, ranging from key chains to stuffed beanbags. Some figures even came with a 23 carat gold card – something else that was likely to keep customers searching. 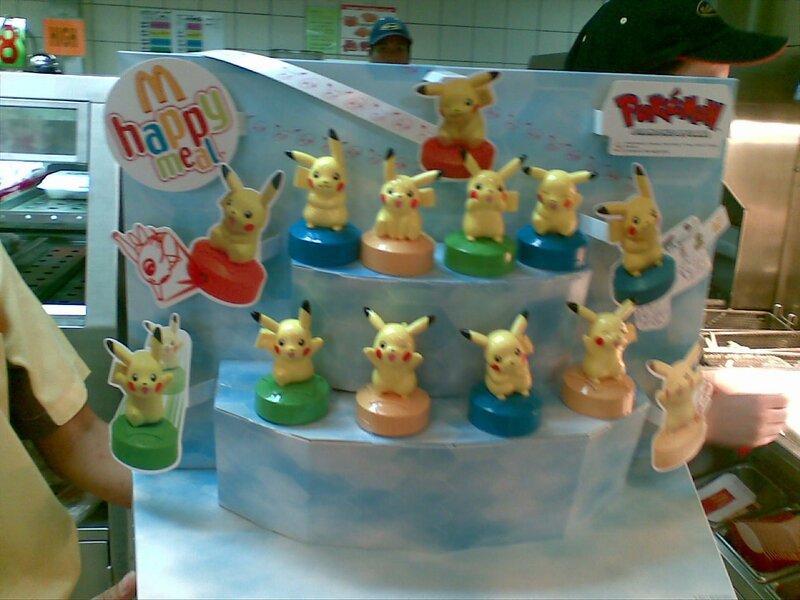 2011 saw McDonald’s Japan give away eight different Pikachu toys in different poses, while McDonald’s Singapore had a promotion involving 28 different Pokeballs that did different things – light up, make noises, etc. Another McDonald’s promotion had a gardening theme – there was a Pikachu spade, a trowel featuring Oshawott and what appears to be a nozzle that connected to a hose. No Bellsprout seeds, sadly. McDonald’s has been luring children with Happy Meals since 1979. If were we told back then that in the future they would be giving away LCD games for free, we would have pulled your Fonzie T-shirt over your head and called you a liar. The fact that we weren’t alive in 1979 is completely irrelevant. 2003’s collection of six games was meant to tie-in with the Sonic X cartoon series, but for some reason also contained a Monkey Ball game. The games were rather basic – just single button affairs. The screens were small also – about the size of a postage stamp – which was obviously to reduce production cost. Sonic Speedway saw the ‘hog dodging traffic while Knuckles Soccer gave the red hued dude a chance to try his (giant) hands at penalties. The dully titled “Sonic Action Game” was the best – an endless runner, if you will, in which Sonic ran along Green Hillzone jumping over hazards. A year later a second wave of games was released, this time including Billy Hatcher and a Big the Cat fishing game. Yes, Big the Cat was granted his own game. With the exception of Billy Hatcher, the games – which had elaborately designed cases this time round – featured artwork from Sonic Heroes. This hilariously bad TV advert from Pakistan has had almost a half a million views. It looks like it was made by somebody who hadn’t used a 3D animation package before, and was then told to have it ready by the following day. Poor old Sonic. 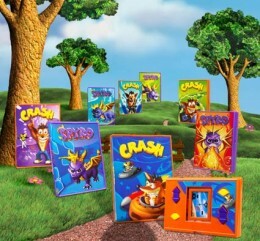 To coincide with the releases of Spyro: A Hero’s Tail and Crash: Twinsanity, eight different LCD games were released over at the yellow arched abode – four starring Spyro, and four casting Crash. The flip-top casing was neat, but as before the games were rather basic. Most involved moving left and right to avoid obstacles. They must have proven popular, as later another set featuring Crash and his cohorts was released. Have a look at the German TV advert below. Saving the best until last? Perhaps – Burger King’s Viva Pinata toys were colourful and creative, just like the game itself. Creativity stemmed from the fact that the toys opened up to reveal one of two surprises inside. Or you could have just stamped on them in true pinata style, we suppose. Those wanting to own them all would potentially face having to eat 18 Burger King meals in total. Still, that’s a nothing compared to those 60 Pokemon toys from 1999. Characters were from the short-lived CGI cartoon show, including Hudson Horstachio, Franklin Fizzlybear, Fergy Fudgehog, Mongo Macaraccoon Sour, Gordon Goobaa and Cecil Cocoadile. According to the press release, Mongo came with a ‘party knocker’. Confused? Yeah, us too. One Viva Pinata fan even went out of his way to form his own Sparrowmint army. We’re slightly jealous, we must admit.